It amuses me when, after a sweet day of trekking to the beautiful, back oblivion of Oak Creek Canyon in Red Rocks, I approach my motorcycle waiting for me to mount it, and a car pulls up and the guy yells out the window to ask, “Are you riding that?”. I look around – there is not another soul or vehicle around me. So I think it’s a funny question – as if ‘my guy’ is going to appear to assist me in riding my CBR. I say, “Yes.” And he nods his head in approval. I just nod back in ,”I-guess-thank-you-for-your-approval”. 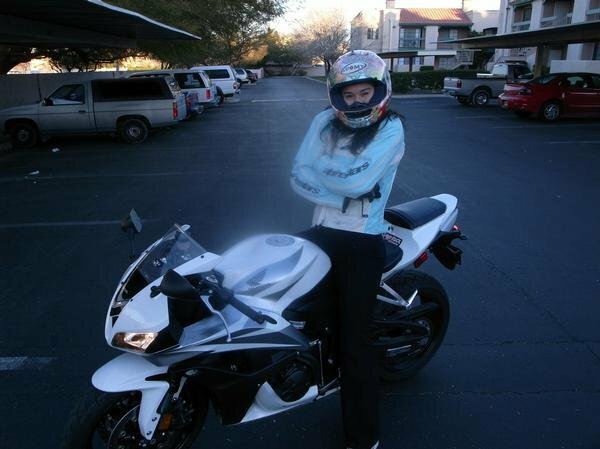 I was almost born on motorcycles. As a little girl of two and three years old, living in Monterey, California for a couple years, my father had at one time or another owned a Honda, Yamaha and a Suzuki motorcylce. The weekend surprise trip was to hop on whichever bike he had at the time…… to the ultimate destination of the merry-go-round – to enjoy riding a different type of mechanical mare; not to mention, topped off with a visit to the ice cream store for a banana split. It was almost natural that linking merry-go-rounds and banana splits with motorcycles would create my affinity for riding and lead me to acquire my bike license at age 22. When I first started looking to learn how to ride (besides having a basic understanding on how stick shift works – even in cars), I found out that community colleges have great instructional courses (although at some, the waiting list is incredibly long). I took my first riding course and test through Leeward Community College in Hawaii. 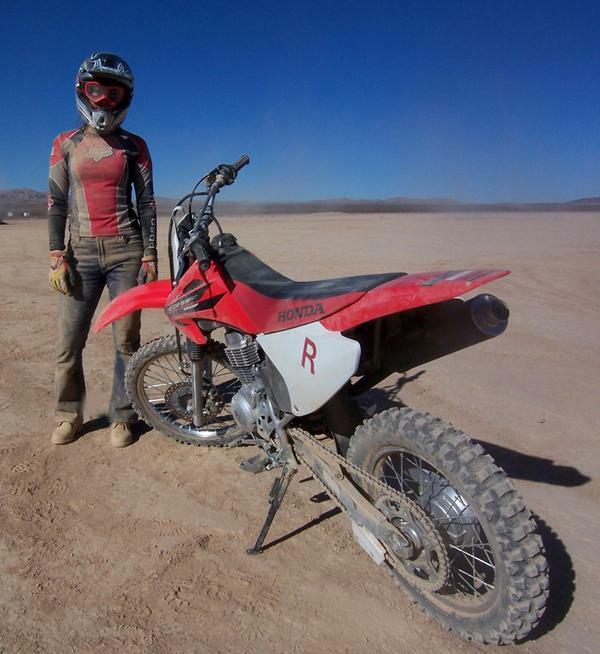 When it came time to refresh my riding skills after I hadn’t ridden in a while, I was in Las Vegas and the community college waiting list there was way too long. It would take months before I got my hands on a bike. Someone suggested I take the dirtbike course instead, which sounded incredibly fun and gave me pretty much the same basic understanding of riding a two-wheeled machine. 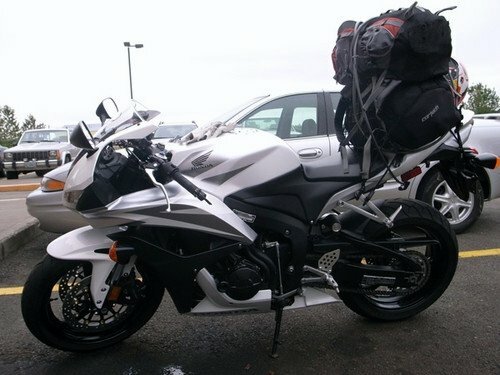 And now I’m on my third bike – a 2007 Honda CBR600. The irony, of all the activities I partake in…from gliding (which has only been 3 times), rock climbing, mountaineering….it’s probably the most dangerous of them all because street riding can be incredibly unpredictable and you leave it up to your own instincts to think ahead and know what the other driver is going to do. You have to imagine yourself constantly invisible in their vantage points so you react upon that. The key is to absolutely stay alert. And maybe try to avoid street driving around urban areas. I’ve considered selling my bike because of it. But I just can’t do it. I truly, truly enjoy the freedom and the exposure of the road it gives me. There is nothing quite like it. 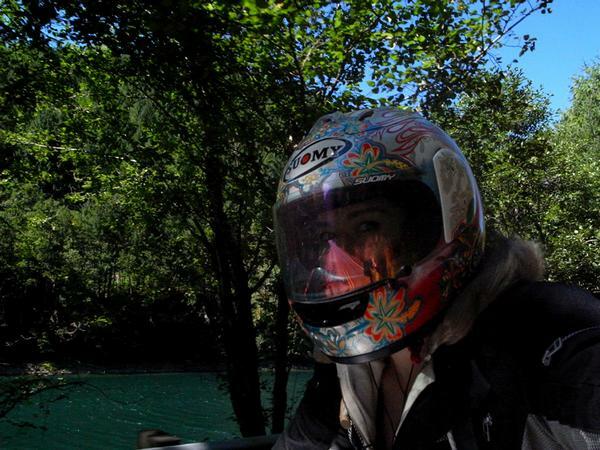 For those who love it too….ride safe ladies. I understand your love for it. From my solo bike trip – from Portland – stopping in Bend, Oregon (Smith Rock climbing) to Las Vegas. Yeah, I overpacked, as usual. Self-portrait while on the move through Oregon…. « Laura’s Story; Tracking the Rising Trail of a Mountaineer’s Tale. n its great to just escape far far away into da unknown on a dream machine. ride hard gal…. u didnt update ur blog was lookin forward to hear from u ……..